These literacy centers will last all month long! 80 language arts centers, 20 per week focusing on reading, writing, spelling, vocabulary, and grammar. Have language arts centers been causing you stress? Do you use the majority of your planning time creating and planning centers? Look no further! I have your solution. 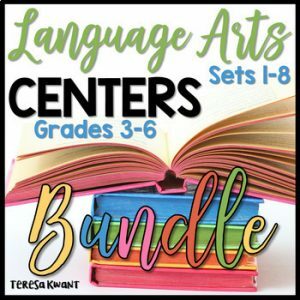 Centers for the ENTIRE month! Just print and go. With these centers you can guarantee that your students will be engaged, learning and reviewing skills, all while having a good time. Get ready to free up your planning time so you can focus on other important aspects of your classroom. 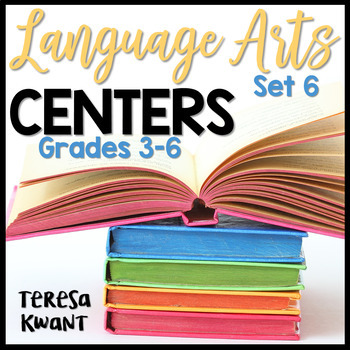 With these centers you will find a centers folder for students to take to each center and keep their work in, pocket chart cards, and planning sheets for you. Not to mention, task cards for each activity! At the end of the product I have also provided CCSS alignment pages. One for each grade: 3rd, 4th, 5th, and 6th. Each week you will have 20 centers to choose from. That is 80 centers for the ENTIRE month! Centers Folder: With this, you can print the cover sheet and laminate the folders so students have a place to keep their work. Inside the folder students can also keep their checklist. The checklist is important, because students can mark off each center they have finished. Pocket Chart Cards: The centers included in this product include: Grammar, Spelling, Writing, Vocabulary, Reading, and Teacher Time. There are extra pocket chart cards in case there are other centers you like to incorporate into your ELA center time. Teacher Checklist: Use this to plan out your weekly centers. Write the students that are in each group and the centers they will go to each day. Task Cards: For each center there is a task card included. Place the center materials and the task card together. Students will read the card, which gives instructions on how to complete the center. Centers: Each center should last about 15 minutes. I have planned for centers to be held Monday-Thursday. Friday can be used as a make up day, or as a time to complete centers you did not have time to for. Depending on your class time allotted to Language arts, you may have to manipulate the amount of centers your class will be able to do. I have given several different samples and ideas on the following pages on how to set up centers. However, you can fit these centers into your daily routine any way you wish. If 6 centers is too much, look at my idea on how to use these centers and only do 4 or 5. Or, choose the centers you do want your students to work on, and save the other centers for another time. If there are ever centers you do not have students do, consider using the centers as self starts, whole group lessons, on Friday, or as homework. Great variety in this bundle! Your centers are the best! My students love them! You have saved my sanity! Thank you! These are AMAZING! Thank you. Centers are engaging and help me meet all our language standards for fifth grade! I use these during our intervention period so that I can work with small groups or hold reading conferences while students are practicing at the stations! Everything is already done for you. Love it! These are wonderful, thank you! I absolutely love these centers!!! Can’t wait to buy the rest!! I have more than enough of these Literacy Centers, but they are so amazing that I can’t resist having them all and this one is no exception!